Did you know that 8 out of 10 startups fail in their first year? The reasons for startup failure are plenty, and mostly behavioral not financial, of which CB Insights was able to identify 20. All these are avoidable mistakes that a business intelligence (BI) tool can help solve, if not limit the impact and ensure longevity for the new company. Despite the clear need for BI even at an early stage, many startups fail to leverage analytics to identify their market or, if necessary, pivot before all the cash burn. Arrogance – the owner lacks a business model, he doesn’t care analyzing a market need or he doesn’t see the need for advisors. Until a few years back, startups might have a good reason to eschew a BI system: it’s expensive and reserved for elite data specialists and R&D professionals. The high capitalization required for hardware and software licenses would discourage even the most optimistic entrepreneur. Not today. Suddenly, the small player has a cloud BI tool which it can afford. What’s more, it’s designed exactly for him or her, the founder, who may not have the training or skills to perform data analytics. Today, BI users can be anyone in an organization. The old guard, the IT gatekeepers, are no longer central to crunching numbers. Yet how many startups do we hear leveraging BI for their pitch decks or round 2 presentations? As part of its campaign to level the playing field for the small business player, Sisense, a cloud-hosted BI system, recently launched a program that grants early-stage companies free access to its big data analytics features. Sisense is integrated in the startups’ products or services, enabling them to track performance, measure efficiency and carry out product-market match processing. 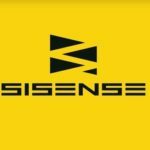 The goal is to help the entrepreneurs survive their first years and, like Sisense (founded in 2008 and now an established player in the BI industry), help them gain a solid market presence. Essentially, Sisense is educating startups the importance of big data analytics even as they lack big data. Although BI solutions like Sisense are good at harmonizing different datasets that had been built over time through various dynamics and standards, that doesn’t mean a company can’t start to implement BI on a clean slate. In fact, startups have that advantage and Sisense is helping them leverage it to reap the benefits of big data analytics. You can read more about the new and powerful Sisense BI features in our separate article. 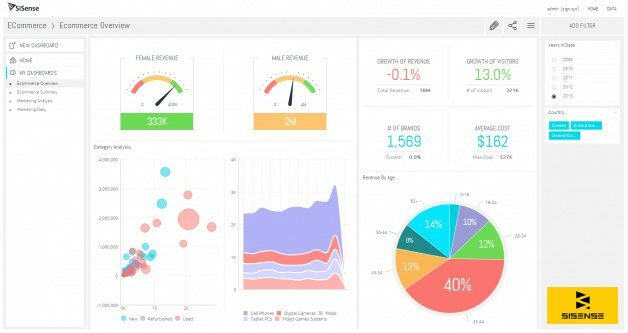 Sisense dashboard, one look and you get the big picture. Because all aspects of running a business are interconnected, thanks to cloud and mobile technology, startups quickly rack up volumes of data in the few months since their launching. Their CRM system continues to gather leads and deals. The help desk hums with tickets and customer issues that validate or contradict early market research. Project management solutions collate best practices and identify bottlenecks as teams pursue their goals. Accounting software kicks in with financial transactions, recording money that comes in and comes out. The data collected by all these systems when pulled together can reveal insights that are valuable to making business decisions when the startup comes to a fork in the road. Likewise, data convinces investors, lack of it turns them off. Cost efficiency. Entrepreneurs can run the numbers with a BI tool and clearly see where money is being spent. This includes payroll, supplies and maintenance. More importantly, they can see which is bleeding the most cash and where they can cut corners and create savings to minimize the burn rate. Manage time and spur revenues. Startups know that fund isn’t the only limited thing in their arsenal. Time, also. A small team can only handle so much work and the cash flow is drying out. Meanwhile, there are more tasks to be done. A BI tool like Sisense can visualize the correlation of your spent time with projected revenues. If you’re using 80% of your day to accomplish paperworks, the startup is on fragile ground. As CEO or founder, your time is best spent on marketing or product development to grow the business fast. Similarly, your small sales team can benefit from business intelligence. For example, an analysis show that only ten percent of your leads are ready to buy. That allows your few reps to focus on prospects with the most potential, saving them time and money. Operational optimization. Sisense or any BI tool isn’t only for forecasting the future. It’s highly useful to fine tune your day-to-day operations. As a startup, you probably are still feeling your way to what works fastest, which supplier gives the best value for money or who among your star performers to include in your management team. There many more operational pain points of a startup, and a good BI software solution can address most, if not all, of these. You will have a better grasp of your product and its position in the wider landscape of your category, and a deeper understanding of who your customers are, really. The good news for startups is, cloud BI solutions are getting more powerful, more intuitive and better at scalability. Sisense is the perfect example, an enterprise-grade BI software any small business or startup company can use and afford.